Dear Students, the Preliminary Examination result of SBI Clerk 2018 is out and you all must be worried regarding your preparations for the Mains Examination. We all know that the pattern of banking examinations changes with every other examination. So, all that you need to do is to be ready for a bolt from the blue and tackle the questions with ease. 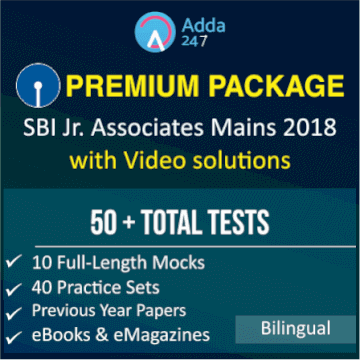 And to help you score maximum marks in the upcoming SBI Clerk Mains Examination, Adda247 is providing you all with an integrated strategy. Main Examination consists of Objective Test of 190 Questions for 200 marks. There are four sections in the objective test, General English, Quantitative Aptitude, Reasoning Ability and Computer Aptitude, General/Financial Awareness. The total test is of 2 hours 40 minutes. You can score well in this section if you follow the right approach. Computer Aptitude is a subject that many students are already familiar with. Although in SBI PO Mains there were no questions from computer aptitude but as an aspirant yearning to score maximum in exam, you should revise this subject as well. So in case if there is a set of questions in this section from computer aptitude; they will help you score. The trick to score in English section can vary from one person to another depending on his/her strengths and weaknesses. The Reading comprehension too should be attempted in a way that you attempt questions based on vocab and phrases first and then the questions that need a deeper penetration through the paragraphs. The important topics for cloze test are subject verb agreement, preposition and verbs. These topics may help you do some other questions too that will be based on grammar. So make sure that you have these topics on your finger tips when you are to attempt the examination. This section plays a very important role when we talk about mains exam. This section becomes the game changer as it is of major importance when you are aiming for your selection in the exam. You must prepare this section really well as it can help you in clearing the cutoff score in the mains exam. To save your precious time, we provide you with an alternative that is Adda247’s “Daily GK Update” (Available in both Hindi and English languages) that contains only the news that is important from the point of view of competitive examinations. It contains all the news that is likely to be asked in the SBI Clerk Mains Examinations. Avoid the habit of ignoring everyday news, telling yourself that you will do it in the end when the examinations are close, you only end up lying crushed under a pile of news. You can go through the Monthly Capsules provided by Bankersadda for both Current Affairs as well as Banking Awareness. For preparing General Awareness you can study with the G.A. Power Capsule it is a compact solution for all your worries related to GK. In this section you have to focus on your speed as well as your accuracy. You must attempt those questions in which you are sure. The trick to scoring marks in Quantitative Aptitude Section is to attempt the questions on Quadratic Equations, Simplification and Approximation first and then going for Number Series. After having attempted all these questions efficiently, go for Data Interpretation. The remaining few questions will be based on miscellaneous topics like CI & SI, Time and Work, Pipes, and Cisterns, Partnership, etc. So students, you have limited time to prepare for this examination. Never forget that the only way to crack banking examinations is practice. Practice is the only way to improve your speed and thus you attempt the maximum question in minimum time with the highest accuracy. IBPS RRB 2018 Preparation Strategy: Get Started!